Whether you have thank you cards to mail out from the holidays still or you want to get a head start on your Valentine's Day cards.....this is a super simple card that you could use for either occasion! If you are in the Sacramento area and looking to attend some classes, make sure you are on my newsletter list by clicking the box to your left. I have totally revamped the way I will be doing them and would LOVE to have you join. There are even ways that you can attend the classes for FREE! 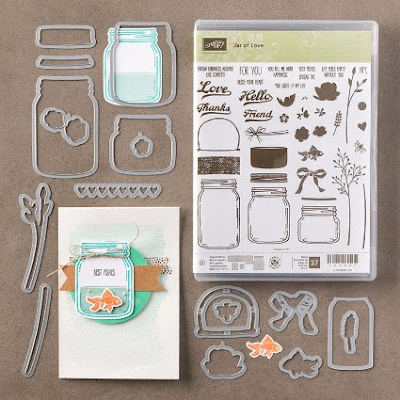 Stamp set & bundle found on page 75 of the NEW 2016-17 annual catalog. See the dies & all images in this set below. Whisper White: 4” x 5 ¼” piece for inside panel and a scrap to stamp both the jar and handle. 5/8” Mini Striped Ribbon-Watermelon Wonder: 5 ¼” piece for wrap on front panel and a 9” piece to make the bow. Linen Thread: See Step 7 below. Emboss the Flirty Flamingo panel using the Woodgrain TIEF and adhere the 5 ¼” piece of the 5/8” Watermelon Wonder Mini Striped Ribbon to the panel as shown by applying adhesive to the back of the panel. Wrap ends and secure on back side. Adhere the Flirty Flamingo panel to the card base. 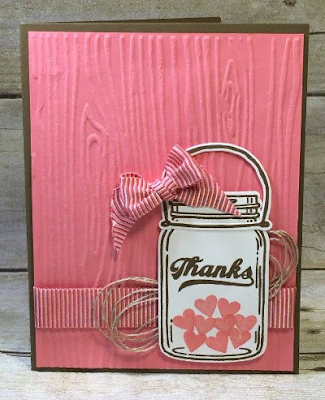 Using the same ink, stamp the “Thanks” sentiment a little above center inside the jar image. Add adhesive to the back of the jar image and adhere the Linen Thread as shown. 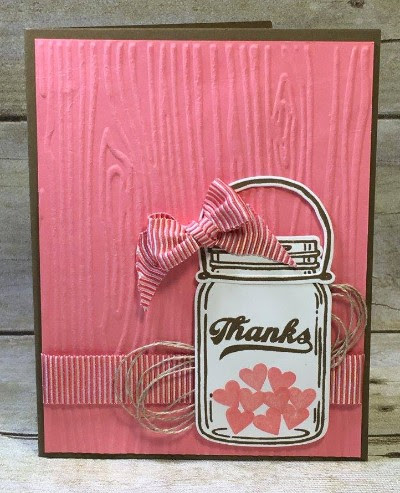 Add Stampin’ Dimensionals to the back of the jar and adhere it to the front of the card as shown. Adhere the jar handle to the jar image as shown.